Last October, I designed a wedding stationery suite for a bride looking for a clean, elegant black and white design. Her mom freaked out a bit about straight black and white, so we added blue in as well. I was so happy with how they turned out! One of my favorite sets that I’ve designed. Shortly after designing them, I showed them to my boss who declared that based on the design, the bride must be from [insert very urban city here! ], and sure enough, he was right! Invitations certainly do tell a lot about a person! 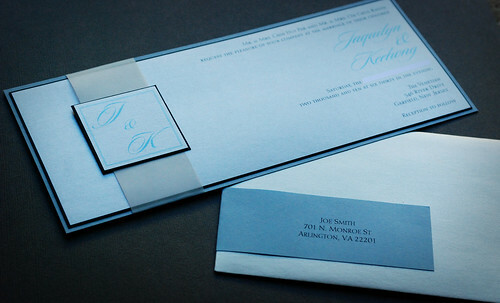 Long invitation printed on metallic paper and backed with blue and black card stock. Matching long envelope with Martha Stewart inspired wraps. I originally had two designs - one A7 size, and one size 10. The bride picked the long one (size 10). Here is the RSVP card and back of the directions card. How do (or will) your invitations reflect your personality? 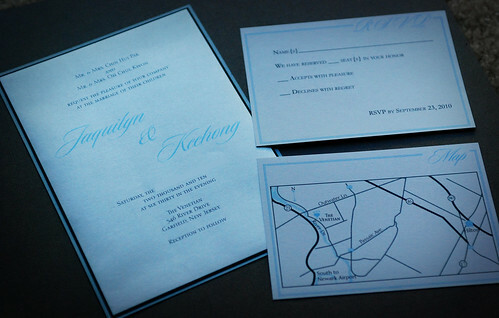 This entry was posted in Design Ideas and tagged black, blue, invitations, wedding, white. Bookmark the permalink. Clean lines and nice presentation. this does have a clean and sophisticated feel to it, very nice.